You know, once you decide to work on a goal, stuff happens and it becomes kind of hard. Take our family goal this year: Try to Show Kindness in All That You Do. Well, people do dumb things. People say dumb things. From where I stand, sometimes it looks like people live dumb things. And, sadly, that makes it hard to be nice. But like the song says, “I want to be kind to everyone, for that is right, you see.” And so it is. It’s right. It’s hard, but it’s right. So even though the first week of January made this feel particularly difficult, I’m going to keep trying. I’m thankful for the Atonement, by the way. I’m thankful that the Savior was so kind that he was willing to offer forgiveness even to people who intentionally hurt him. And then he still offers forgiveness to those of us who get angry when people are intentionally mean to us or toward people or things we hold dear. It’s hard to be kind and angry at the same time. Believe me, I’ve tried. I found out that kindness is much easier if I just give the angry back to Jesus and let him take care of it. He always does if I let him. Thanks so much to a sweet reader who stumbled upon my request for something to hang on my wall to remind me about my new goal. In a quick whirlwind of talent and kindness, she created this printable (above) for me, and I love it. You’re welcome to download your own copy here. Thanks, Jen! Somewhere on Facebook, a friend also shared this video of the primary song that’s the source of the goal phrase. It’s really quite lovely, and I felt the spirit confirming the simple, sweet message as I listened. Hope it adds a dose of goodness to your day, too. a very cool rendition! 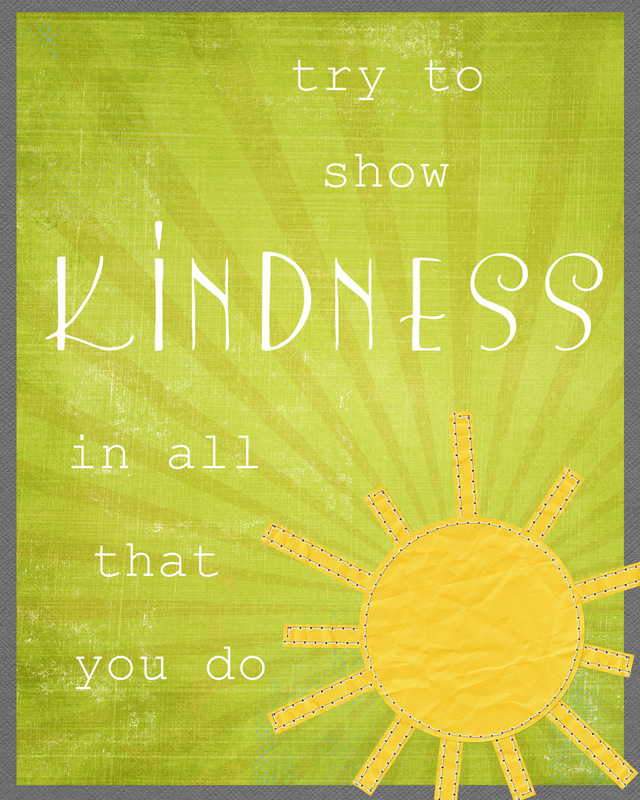 Thanks again for inspiring all of us to “try to show kindness” in all that we do…it’s an every day endeavor! Thanks for sharing this! It also reminds me of the fact that there are always two sides to everything. There is our own perception, and the perception of others. I think that making that extra effort to be kind can take the edge off of difficult situations. Like you said if you give the hurt and frustration back to the Lord he takes care of it, it was taken care of for us and it is such a beautiful thing. If being nice and kind is truly our intention then it will come across, at some level at least. It is such a simple concept and one that we’ve been taught our whole lives, its funny how often we forget about it knowing this. I feel like I’m rambling, thanks for reminding me of that beautiful Primary song, such profound words to live by! I thought that things like that only happened at my house…like when the kids open a package of hot dogs, cook one then just set the package back in the fridge without sealing it in a bag and the rest of the hot dogs dry out and I have to throw them away! These things are all to regular at my house. Thanks for sharing, its so nice to know that we are not alone..in fact your post just put a huge smile on my face so thanks for that! This song is going to be our theme for family night tonight, I think a healthy discussion about it is going to be wonderful. My kids are all teens so maybe they need a reminder about this song. Anyway, have a fabulous day! That would be “are” hard for me! Ha! Such a hard one for me, too. I’m too honest and blunt and forward and…well, I need to be nicer. Much nicer. I think I may jump on your bandwagon and make this a family goal for ourselves, too! What a great print out. Whenever I start a new goal it seems like the world conspires against me. Love your kindness goal and more importantly love your testimony of Christ. Seriously. It’s so hard. And Iove the graphic! Lovely. I’m Trying to Be LIke Jesus is the best song. Seriously. It’s what it’s all about. And I love David singing it. We listened/watched this video at book club today and really felt the spirit! Thanks! I have fond memories of singing the ‘kindness begins with me’ song on my mission, but not for the reason you’d think. When sung in rollicking Polish, it sounds more like a drinking song than anything else and we missionaries thought that was really funny for some reason (I know, so much for quiet dignity). Still, I’ll never forget the words, and the translation is a little bit different. Directly translated it is, “I want to be good to every person, ’cause that’s how God would have me live, so I repeat to myself, ‘be good,’ …so that’s how I will be.” I may have taken some liberties with that translation (LisAway could correct me) but I like the part about how we do it because that’s what God wants, and I especially like the part about ‘repeating’ it to ourselves, cause we could always use a little reminder. Isn’t that always the way? I always find that the more determined and resolved I am to accomplish something, the more things come out of the woodwork to stop me. Thanks for reminding us all how important it is to let go of the angry and embrace the kindness. I felt really prompted to come back and read this post. I just remember a few years ago while working in primary I realized that the most powerful doctorine we have is taught in primary. The gospel really is that simple, and that powerful. The answers are just right there aren’t they? This is my go-to song to hum when I’m feeling the need for a little more loving tone to my day! And? I just love Primary songs.